B&W image with two pictures. In the top one a man is seated at the computer and in the bottom one an office environment is pictured with the computer in the foreground with a workstation in the background, there are printers and plotters and othe workstations at the left side. Bottom label " The HP 9000 family of 32-bit computers is intended primarily for computer-aided engineering (CAE) applications. 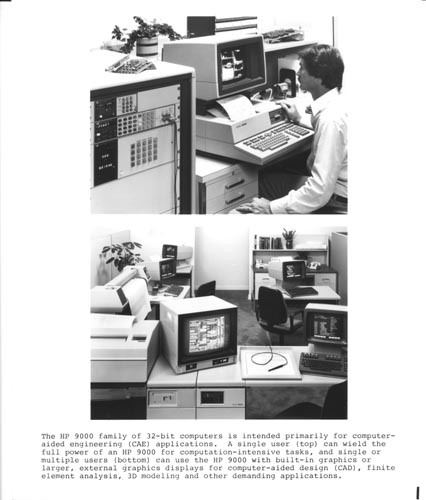 A single user (top) can wield the full power of an HP 9000 for computation-intensive tasks, and single or multiple users (bottom) can use the HP 9000 with built-in graphics or larger, external graphics displays for computer-aided desigh (CAD), finite element analysis, 3D modeling and other demanding applications."